Motor Trend is an American automobile magazine. It first appeared in September 1949, issued by Petersen Publishing Company in Los Angeles, and bearing the tagline "The Magazine for a Motoring World". Petersen Publishing was sold to British publisher EMAP in 1998, who sold the former Petersen magazines to Primedia in 2001. As of 2017, it is published by Motor Trend Group. It has a monthly circulation of over one million readers. The contents of Motor Trend magazines are divided up into sections, or departments. Motor Trend magazine provides its readers with written "road tests" of vehicles. These road tests are published monthly, and are meant to give readers information about the featured vehicle, certain aspects of the vehicle, and what the readers can expect if the featured vehicle is purchased. There are two main types of Motor Trend vehicle comparisons. Regular comparisons usually compare two to three vehicles, and what each is like to own, drive, etc. On Motor Trend's YouTube channel (titled "Motor Trend Channel), Motor Trend puts up their best comparison of the month on a series called "Head 2 Head," where Motor Trend editors compare cars via YouTube. "Big Test" comparisons typically feature anywhere from five to seven vehicles, all being compared against each other. In a way, a vehicle comparison is like a large road test featuring many vehicles, rather than just one. The Trend provides readers with the latest what's happening in the automotive industry. This section may feature news about manufacturers, recalls, etc. "Newcomers" (recently redesigned or all-new models), along with short informative articles about them, can also be found in this section. Motor Trend keeps a fleet of long-term test cars at their headquarters in Los Angeles, California. The majority of the Motor Trend editors are each assigned a car, and their duty is to drive that car on a daily basis and report on what's happening. Each month, one to two new vehicles are added to the fleet, to replace the one to two vehicles leaving the fleet. Each long-term test lasts approximately one calendar year. Not every vehicle receives a printed update each month, though the vehicles are still there. This section is typically located towards the end of the magazine. Other types of articles are sometimes featured in the Motor Trend magazine. There is typically one special feature per month. For example, in one issue of the magazine, there may be a special feature about Motor Trend's "Real MPG" testing. For these tests, Motor Trend measures the "real-world" fuel economy of a vehicle in a number of conditions, and then compares their results to the EPA estimated fuel economy that manufacturers provide dealerships, who then provide it to their customers. One of the earliest and most enduring of the magazine's creations was its Car of the Year award, given almost continuously since its inception, although the phrase itself would not become entrenched until well into the 1950s. It predates the European Car of the Year award begun in 1964. The first winner was the 1949 Cadillac, which featured an innovative overhead valve V8 engine; while the company initially turned down the award from the brand new magazine, it now proudly references it's COTY wins in publicity materials. The award has gone through several splits and permutations over the years, being called the Golden Wheels Award for a while in the 1970s and having given rise to Truck of the Year and Import Car of the Year as well as SUV of the Year. Nevertheless, it is still coveted by manufacturers and is usually covered by the mainstream press as the most important distinction awarded in the American auto industry. Some recent COTY award winners include the Chevrolet Volt (2011), Volkswagen Passat (2012), Tesla Model S (2013), Cadillac CTS (2014), Volkswagen Golf (2015), Chevrolet Camaro (2016),Chevrolet Bolt EV (2017), Alfa Romeo Giulia (2018) and Genesis G70 (2019). The magazine releases a special edition every September and October listing the latest new vehicles. In September the issue looks at the latest cars (sedans, coupes, etc.) for the next coming calendar year, whilst in October the magazine looks at off-roaders, MPVs and sport-utility vehicles (SUVs). Truck Trend magazine presents features and the latest news about the truck, SUV, and crossover segments. Additionally, the Readers' Rides section allows readers to post images and information about their own vehicles. Truck Trend began in 1995 as "Truck Trends," a section of Motor Trend itself. It became the stand-alone publication Truck Trend in 1997. Motor Trend Classic, which took a break from publishing in the late 2000s, was restarted in 2010. It includes articles about significant classic cars from around the world made during the last 60 years. Publication was later suspended again, and as of 2014, Motor Trend Classic was no longer being published. Motor Trend On Demand is an online television service. It features television series from Motor Trend, Automobile Magazine, Hot Rod, Super Street and Four Wheeler, such as Roadkill. In 2015, TEN bought Torque.TV and integrated it into the service, adding coverage of motorsports competitions such as Blancpain GT Series, Pirelli World Challenge, Deutsche Tourenwagen Masters, V8 Supercars, British Touring Car Championship, TCR International Series, FIA European Formula 3 Championship, European Le Mans Series, Australasian Safari, Motoamerica, Endurance FIM World Championship, Motocross World Championship, AMA EnduroCross Championship, and FIM SuperEnduro World Championship. In April 2018, following the acquisition of a majority stake in TEN by Discovery Communications, it was announced that its U.S. cable channel Velocity would rebrand as Motor Trend Network later in the year. In Italy, the channel Motor Trend began broadcasting on April 29, 2018 at 6:00 am with the Car Crash TV in place of Focus, whose brand has meanwhile passed into the hands of Mediaset. In 2009, Motor Trend introduced a certified used car program, beginning with dealers in Atlanta, Georgia and Cincinnati, Ohio. As explained in their press release, the program is powered by EasyCare. 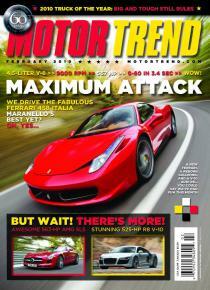 ^ "Motor Trend Names New Editor-in-Chief". ^ "AAM: Total Circ for Consumer Magazines". Audit Bureau of Circulations. Retrieved 2017-02-10. ^ David N. Lucsko (2008-10-07). The Business of Speed: The Hot Rod Industry in America, 1915–1990. JHU Press. p. 247. ISBN 978-0-8018-8990-5. Retrieved 2015-07-24. ^ "Motor Trend". Echo Media. Retrieved 2017-02-10. ^ Flory,, J. "Kelly", Jr. (2008). American Cars 1946-1959. Jefferson, NC:: McFarland & Coy. p. 190. ^ "Cadillac CTS Scores Second Motor Trend Car of the Year® Award" (Press release). Cadillac. 2013-11-07. Retrieved 2015-07-25. ^ Evans, Greg (August 3, 2017). "Discovery Communications Partners With TEN Network For Auto Portfolio". Deadline. Retrieved September 18, 2017. ^ Petski, Denise (2018-04-10). "Discovery Rebrands Velocity As Motor Trend Network". Deadline. Retrieved 2018-04-20. ^ Littleton, Cynthia (2018-04-10). "Discovery Rebrands Velocity as Motor Trend Network (EXCLUSIVE)". Variety. Retrieved 2018-04-20. ^ "Dal 29 aprile arriva Motor Trend sul canale 56 del digitale terrestre. Focus sul 35 dal 17 maggio" (in Italian). ^ Ramsey, Jonathon (2009-01-24). "Motor Trend getting into the used car business". Autoblog". Retrieved 2009-01-24.